She thinks she’s so slick. That was what Drew was thinking as he entered the Lillian Hotel-Fort Worth. She thought she’d been quiet enough to sneak out of the house without him noticing. But he’d heard the moment her feet hit the floor when she woke up. He’d heard her when she went to the shower. That sound had set off all kinds of visions in his head. Her soaking wet body in the shower, washing herself. Images of him in the shower with her. Then he heard the sound of a vehicle pulling up and he got up to look out the window to see a cab waiting. He shook his head. He’d told her how expensive it would be to have a cab come all the way here, and then drive her all the way to Fort Worth, but she hadn’t listened. He figured at this point it was mainly because of that kiss the night before and now she was trying to avoid him. That was the only reason that he didn’t open his bedroom door when he heard her ‘tiptoeing’ past in the hall and down the stairs. She was avoiding him. For some reason that didn’t sit well with him. Constance Johnson never backed down from anything or anyone. Especially him. And that’s what had gotten him up and out of the house to Fort Worth to the hotel. He knew it was probably a bad time and that he could have waited until she returned to the house later that evening, but he had a feeling that if she had her way, she would only be returning for her things. That wasn’t an option. Well, technically it was; he most certainly wouldn’t keep her against her will. But he wanted to get to the bottom of whatever it was that had caused them to no longer be friends all of those years ago and he had a feeling that would be much easier if she were staying at his place. He scanned the lobby and saw her immediately standing at the reception desk. He’d intended on sneaking up on her, but the receptionist recognized him and lit up. “Of course they know who I am,” he shot back. He knew she was seething, but that was just fine with him, because he was just as ticked off. They entered the conference room and she immediately jerked her arm away from him. She stood there, looking confused by his seemingly random question. At the mention of her grandfather, he noticed an odd expression flash across her face, then she seemed to relent. “Constance?” She was pushing his buttons again. 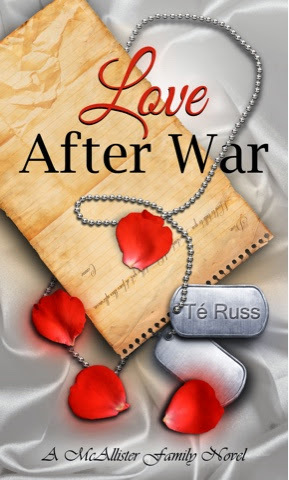 Love After War, coming Valentine's Day Weekend. Now availalbe for preorder.